AM Dolce Vita: All Set for Christmas! Realizing how monochromatic my kitchen appears after the recent makeover, I am determined to introduce some color pops to create visual interests. 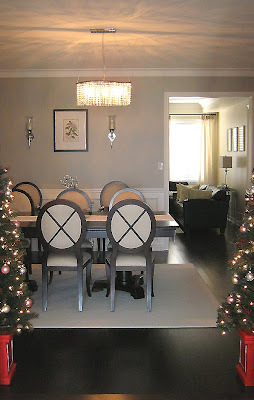 And what better time to do so than Christmas, 'tis the season to decorate with splashes and splashes of colors! 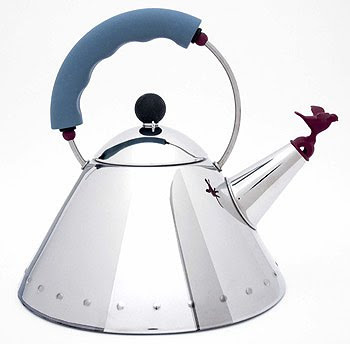 I fancy this Alessi Michael Graves Kettle with Small Bird-Shaped Whistle from Gabriel Ross for a while (or anything Alessi, I've been hooked on their designs since I did a MBA case study on them years ago), so I brought home this pretty lady online just in time for some high tea with girlfriends during holidays. 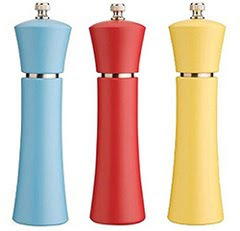 I picked up the Paderno Pepper Mill in Blue from HomeSense by chance the other day, and since bought a Salt Mill in Yellow and another Pepper Mill in Red to complete the set. Paderno Canada web site has a great sale going on now where you can get these mills at 30% off. And how can I be all set for Christmas without the tree and lights?! This year I am also going for a chance: instead of one humongous 7-Ft tree I used to put up every year, I picked up two of these 5-Ft Prelit Potted Christmas Trees from Canadian Tire. I added some vintage balls (yes, they are from my mother-in-law and just as young as my husband) and voilà, I have them flank the entrance to the dining room to make my guests feel like VIPs. We are adding exterior potlights before Christmas so that's all we put up this year so far. That's is for now.